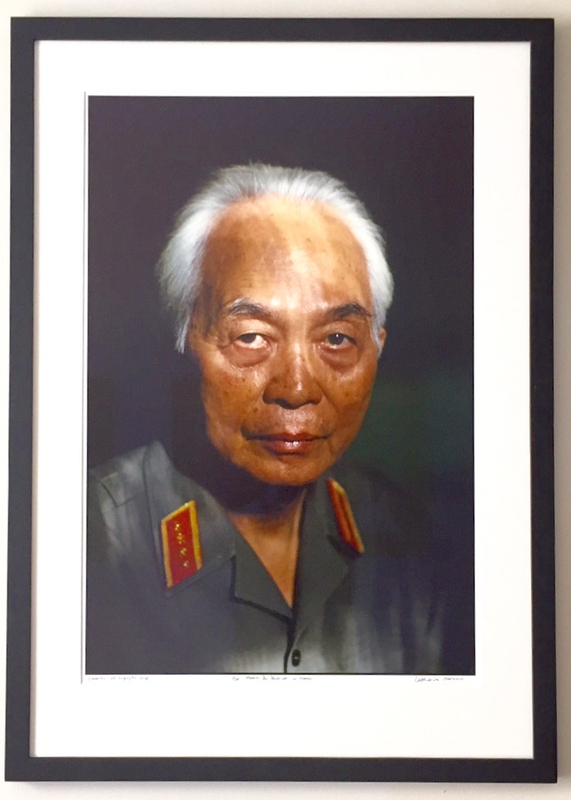 Catherine Karnow’s portrait of general Vo Nguyen Giap, a history teacher, who barely knew how to fire a gun. Trained by US military advisers during WWII, Giap went on to become the commanding general of one of the most formidable armies of the 20th century. 25 years ago, the late journalist and historian Stanley Karnow travelled back to Vietnam to finally meet the legendary Vietnamese general Vo Nguyen Giap. Karnow’s daughter Catherine, a young photographer, went along a few months later and came to share her father’s unique access to the enigmatic North Vietnamese General. Stanley Karnow, a veteran reporter of the wars against the French and subsequently the US-supported Saigon regime, was one of the very first Americans who anticipated the implications of the US engagement in Vietnam. Shortly after the Kennedy administration came into power, Karnow asked the President’s primary adviser Robert Kennedy, if Vietnam should not be seen as the major foreign policy challenge for the US. “We got 30 Vietnam’s a day,” Robert Kennedy retorted. Karnow went on to cover the war until the end in 1975. As the first American journalist after the war, he was allowed to visit communist Vietnam in 1982 on a research trip for his widely admired ‘Vietnam – A History’. To Karnow’s frustration, Giap along with other enigmatic top figures like Le Duc Tho was unavailable. ‘Only’ Prime Minister Pham Van Dong – a legend in his own right – would speak to Karnow. Eight years later, Giap finally agreed to talk to Karnow. The outcome was a fascinating interview with the old general in the New York Times. On this rare occasion, Giap shared with Karnow his life from the early days, when he was expelled from school for subversive activities against the French Colonialist regime, the death of his first wife in a French prison, the sleepless nights before the final battle at Dien Bien Phu, The 1968 Tet Offensive, and the ‘final victory’ in 1975, when the North Vietnamese forces and their Southern allies moved into Saigon. In the interview, there is no indication of any kind of personal hostility from Giap towards the Americans. On other occasions Giap spoke highly on his very first encounters with US military personnel. During WW II, Giap and his comrades received weapons and training assistance from the US Office of Strategic Services, the predecessor of CIA. At the time, the US saw the Vietnamese guerillas as important allies against the Japanese occupation forces in Vietnam. Giap himself fondly remembered, how a young American soldier, Henry Prunier, had trained him to throw hand grenades. In 1995, Giap spotted Prunier in a visiting US delegation to Hanoi. Giap picked an orange from the bowl in front of him and lobbied it hand grenade style to Prunier, the General’s way of showing his visitors that he had not forgotten the past. During WW II, the relations between the Vietnamese resistance leaders and the so called ‘Deer Team’ (the code name for the military advisers) became cordial to the point that US team leader assisted Ho Chi Minh in drafting the Vietnamese Declaration of Independence. Ho Chi Minh and Giap posing with the members of The Deer Team, the US military advisors, who assisted the Vietnamese resistance movement in their struggle against the Japanese occupation forces during VWII. Giap is seen in the white suit and tie, Henry Prunier is seen behind to the right of Giap. Just a few months ago, I had the privilege to meet Catherine Karnow in Hanoi at her exhibition of photos, taken in Vietnam during the past 25 years. Her works are some of the very best I have seen on post-war Vietnam. In my eyes, her portrait of Vo Nguyen Giap is the finest of them all. Ms. Karnow and the Art Vietnam Gallery made a print available for me, which is now on the wall in our home here in Hanoi. 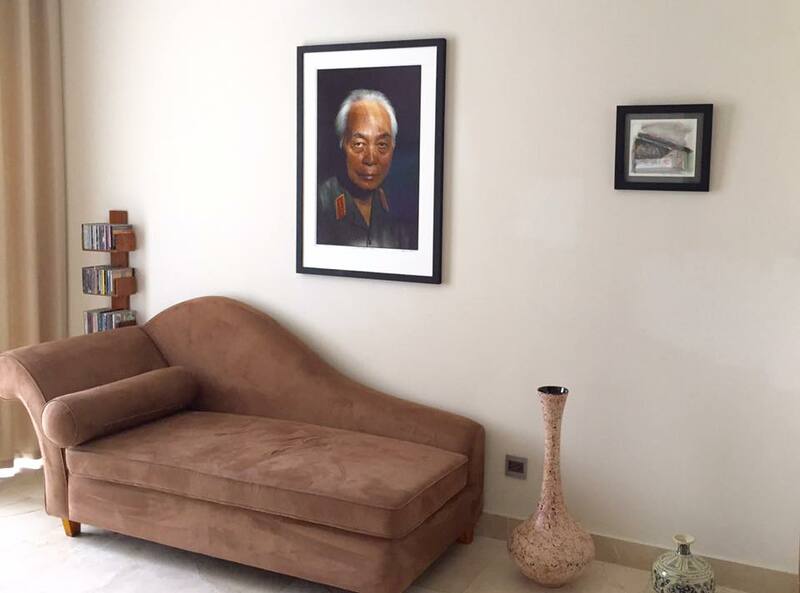 Below the portrait is a comfortable couch, perfect for reading once again her father’s 1983 tour de force ‘Vietnam – A History’. His compelling narrative was instrumental in making me pack my bags for Vietnam as a young reporter in those days. 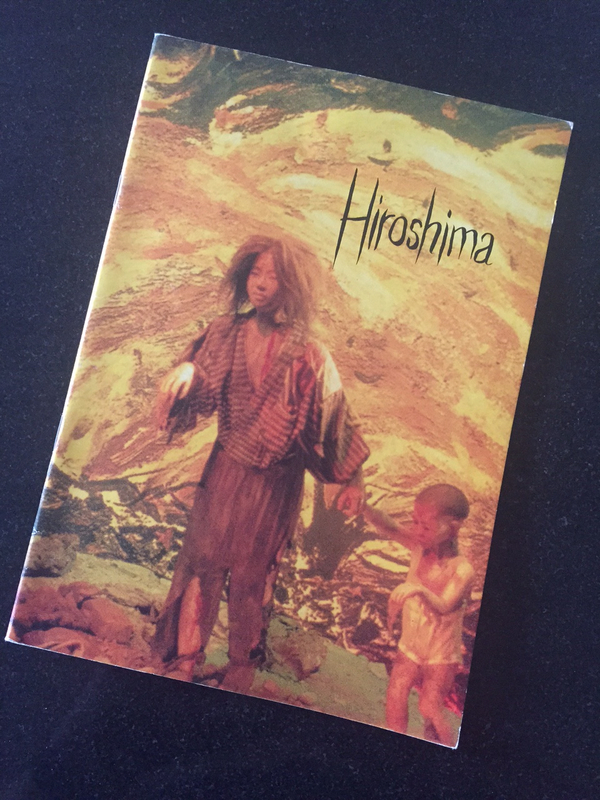 On 6 August, it is 70 years since the first atomic bomb detonated over Hiroshima. 30 years ago I and photographer Ole Johnny Sørensen went there to look into what the military term ‘collateral damage’ means in the real world. I still keep my notes from those disturbing encounters with human beings, whose fate was labelled as ‘acceptable loss’ to the military strategists, who devised the strike. One of them was Yasue Yoshida, a 57 year old woman. Her testimony deserves to be remembered still today. At first glance, Yasue Yoshida looks like most Japanese women – a decade younger than her actual age, 57 years. She gracefully enters her living room from the minute kitchen and gets down on her knees the traditional Japanese way and approaches us, offering a lacquer tray with green tea and cookies. As she is getting within a meter’s distance, her youthful appearance becomes a deception.The thick white make-up can no longer hide the web of tiny scars all on her face, on her arms – on all visible parts of her skin. “I was only 17 years old in 1945, and they told me I was so beautiful. There was a big army base in Hiroshima. I really had a hard time keeping the young soldiers at bay. Yasue worked as a clerk at a tobacco factory two kilometers from downtown Hiroshima. She had just arrived at work, when the American B-29 bomber Enola Gay, named after the pilot’s mother, prepared the final descent over Hiroshima. 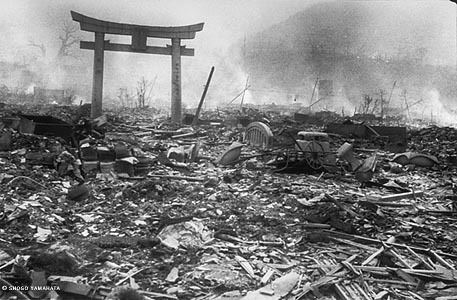 At 08:16 am Japanese time the Bomb detonated, killing 80.000 people in a flash. Tens of thousands of fatal victims were to follow – some from their initial injuries and others for years to come from the effects of radiation. “I was working a few meters from the windows. The impact of the blast sent thousands of little pieces through the air and into my body.I was lying unconscious next to my desk, when the rescue team arrived, they later told me,” Yasue quietly recalls, offering small, decorated cookies with downcast eyes and a little smile. The doctors managed to stabilise Yasue and brought her through the infections that followed in her damaged body. Yasue soon realised that the doctors had only managed to remove the visible glass pieces in the top layers of her skin. “Even these days – 40 years after the bomb – new pieces of glass keep emerging from my body. In the past two years alone, I have been in surgery three times. Yasue holds up a jar, which is half full of glass pieces, found in her body over the years. Our report on Survivors’ testimonies published in 1985. 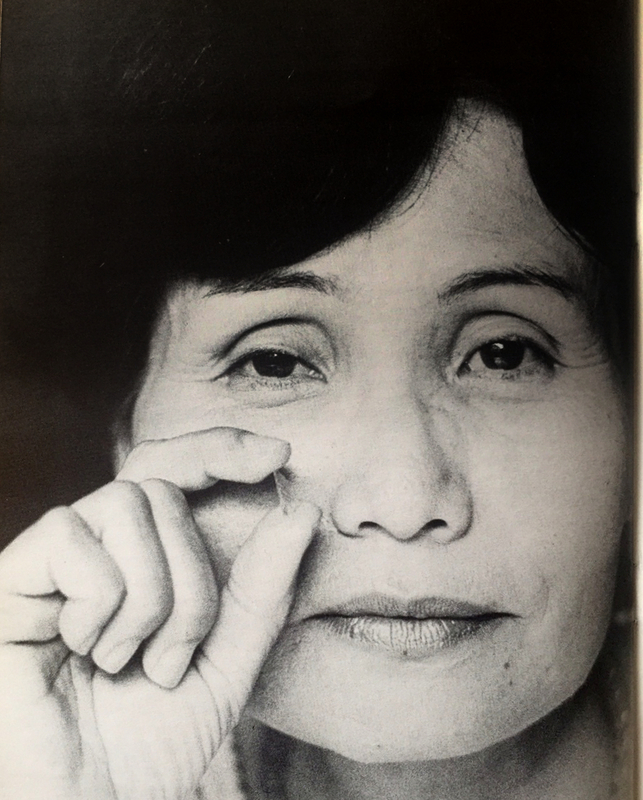 In 1968 Yasue was awarded the maximum disability pension of approximately USD 1.000 a month. In addition she can apply for free medical care and refund of her expenses for medicine. “Whenever I need surgery, I have to get approval in advance to obtain compensation for my expenses. I get so depressed, while I wait. Sometimes I cannot help thinking that my father and my younger brother were much luckier than me. For many years after the bomb she suffered from discrimination like many other survivors from Hiroshima and Nagasaki. “We wanted very much to have our own children, but we were so scared that something would be wrong with them. Finally, we decided to take the risk. Yasue lifts up her black hair to show me the white roots. “My hair became white, when I was thirty. It happened after an acute appendicitis sent me into surgery. I almost died because I could only handle very little loss of blood. The doctors told me already then that my intestines looked like they belonged to a much older woman. These days, I do not have the courage to ask any questions, when I go to my medical check-ups every six months at the hospital,” Yasue says, her voice trembling. “It is still very difficult for me to talk about my life as Hibakusha. For more than 25 years I never said a word and I never attended the annual memorial services for the victims. In 1981, our Pope visited Hiroshima and he encouraged us to speak up. I began accepting invitations to talk to schoolchildren. In the beginning it was unbearable. I broke down and cried in front of them.Then I started receiving letters from some of the children. They wrote that the meeting with me made them understand, why we must do everything we can to oppose nuclear weapons. These letters give me the strength to continue. For 6 years after our meeting Yasue and I exchanged Christmas greetings. She always enclosed her own hand made minute paper dolls. Then she became quiet. The Atomic Bomb Survivors Relief Law defines hibakusha as people who fall into one of the following categories: within a few kilometers of the hypocenters of the bombs; within 2 km of the hypocenters within two weeks of the bombings; exposed to radiation from fallout; or not yet born but carried by pregnant women in any of these categories. As of March 31, 2014, 192,719 hibakusha were recognized by the Japanese government, most living in Japan. The government of Japan recognizes about 1% of these as having illnesses caused by radiation. 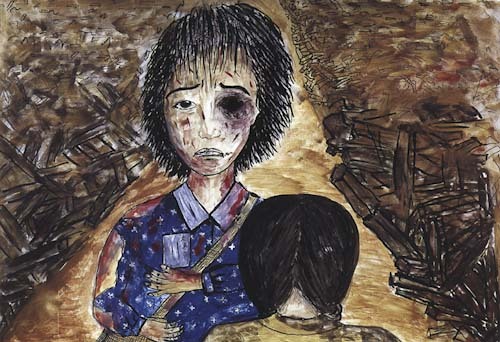 Hibakusha are entitled to government support. They receive a certain amount of allowance per month. About 1%, certified as suffering from bomb-related diseases, receive a special medical allowance. The memorials in Hiroshima and Nagasaki contain lists of the names of the hibakusha who are known to have died since the bombings. Updated annually on the anniversaries of the bombings, as of August 2014 the memorials record the names of more than 450,000 hibakusha; 292,325 in Hiroshima and 165,409 in Nagasaki.